When Wahoo hits your lure at 60 miles an hour and runs your 30 lbs test line for a few spurts of 100 to150 yards , you have discovered an allure that no other fish will give you. The Wahoo or (Acanthocybium Solanderi) is lean, sleek, torpedo looking fish that may be confused with a king mackerel to someone who has never seen one before. The mackerel however does not run like a Wahoo nor does it display the classic vertical bands that extend its lateral lines. The Wahoo are also normally found in deeper blue water zones where tuna are often running, as is the common case in the Azuero Penninsula. Among Azuero fishermen, few argue that there is a better tasting fish than the Wahoo. Living in Panama for many years, I have seldom seen cases where even local fishermen are willing to sell their catch (having often tried to negotiate a loin or two on the days to busy to catch one myself). It can be argued that there isn't a fish in the ocean that has whiter meat than a Wahoo and the texture of the meat makes you want to eat all of it as Sashimi, Sushi or very lightly seared. It is a crime to cook this fish for longer than a few minutes, as there is no need to alter its texture from its ¨right out of the water texture¨The musculature of the fish allows fishermen to easily remove the four loins along the fish´s body and slice the loins in small nugget like circles that are perfect mouth watering size. In Panama, Fishing Wahoo hits a peak in October but begins as early as May. Wahoo grow rapidly from birth often growing to five feet in range. The older ones seem to be rounder at the girth, the bigger ones often reaching above 70 pounds. On average in the Azuero Pennisula Wahoo are caught between 40 and 80 pounds. 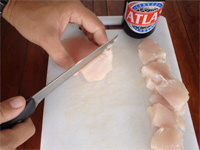 In Panama, Wahoo is not sought out commercially and even difficult to hook one on rod-and-reel due to their hard mouth and razor sharp teeth. Hence, they are often lost as often as landed. When it comes down to it, Wahoo are not under much fishing pressure and no regulations to date have been imposed- creel or size limits. 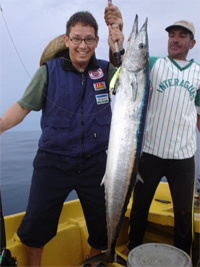 To catch a Wahoo, a fisherman will needs over 100 lb. steel test leader and it needs to be about 3 to 4 feet in length. It is often that you will see the marks of the leader wire along the sides of the Wahoo body after catching one. On a few occasions I have witnessed fishermen wanting to use monofilament test leader only to be amazed at the mono shreds left from the hoos razor like teeth. To cach them, our local fishermen will recommend Rapala And Yozuri lures anywhere in the 3 to 5 inches range. Your luck with the lure will vary depending on what the Wahoo are eating in the area you are fishing. In Azuero we use the following colours, Purple rapalas, the classic Red head-white body rapala, theYozuri Crystal, Grey head lure, the Rapala tiger striped lures and the Yozuri bright green 3 and half inch lures. In Azuero Panama, we troll for Wahoos. I can´t say I have caught them any other way. When the word is out that they are around, we´ve rarely failed to catch them.